Hãhã is a Maori word which means savoury and luscious. Hãhã Wines are a family owned wine company based in Hawke’s Bay New Zealand established in 2011, with a focus on producing consistently high-quality wines to be enjoyed across all types of occasions. Our talented winemakers and dedicated growers create our wines from sustainable vineyards in the renowned Marlborough and Hawke’s Bay regions of New Zealand. Hãhã Wine has been selected as one of New Zealand’s most innovative wine companies and is number two New Zealand wine poured on premise in Australia and a top seller in many other countries. In New Zealand’s largest retailer, Hãhã is currently the fastest growing wine sales across all varieties. Our New World innovative approach includes establishing long term grower contracts selected in the very best sub regions with the most ideal soils and geography to allow us to harvest high quality low yield grapes for specifically for the varietals of wine we produce. We then contract state of the art facilities to enable our award-winning winemakers to produce delicious wines to the very best of their skills and abilities. We currently produce ten wines which we deliberately style in a fruit forward style, with richness, structure, and finishing with a clean New Zealand freshness and purity. Ashton Ireland, Director and a Hãhã Wines founder was also selected as one of New Zealand’s most innovative wine people. 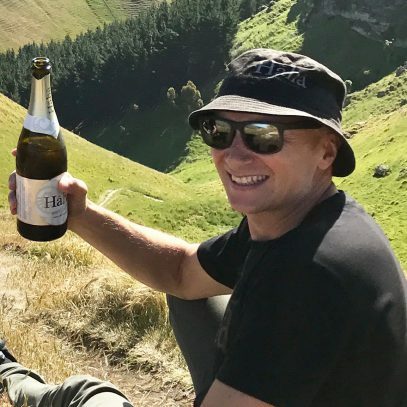 Ashton has been in the wine industry for many years and has combined knowledge and experience from working in New Zealand’s high fashion industry, retailing and wine. Most of Ashton’s focus is now on working with and supporting the international and domestic customers although he loves being involved in blending and wine making and production decisions. Ashton enjoys the great outdoors and mountain biking both in New Zealand and around the world. The vineyard is situated in the upper Waihopai Valley of Marlborough New Zealand. Latitude and longitude of 41.6 degrees south and 173.6 degrees east, and an altitude of 60-80 meters. There is a significant marine cooling influence with easterly afternoon and evening breezes dropping the temperature by 5 degrees. The geography is important with the vineyard situated on an elevated old riverbed. This provides well drained soils and benefits from the elevation on a good water table, such as high vine footing above the water supply, so they are not getting too much water and not too stressed from lack of water. The cooler upper valley location but specifically elevated area helps with avoiding frosts compared to the lower lying areas, and the vineyard location is on the dryer side for rain in the valley. This is from a warm climate, but vineyards specifically selected from a coastal area and a high-country property to give a cool climate effect. The coastal vineyard is in Bayview which has a sea breeze which comes in from 11am most mornings with a significant cooling effect on the vines. The high-country property is in the Dartmore valley with approximately 100 meters elevation providing the altitude cooling effect. This is from a vineyard in the Awatere Valley which is an ancient elevated riverbed with great drainage and afternoon ocean winds which typically cool 10 degrees lower than the nearby Wairau Valley of Marlborough.